Discussion in 'News' started by -smash-, Aug 10, 2011. A couple of dedicated fans were found outside of Valve's offices today picketing for the release of Half-Life 3 - God bless them. 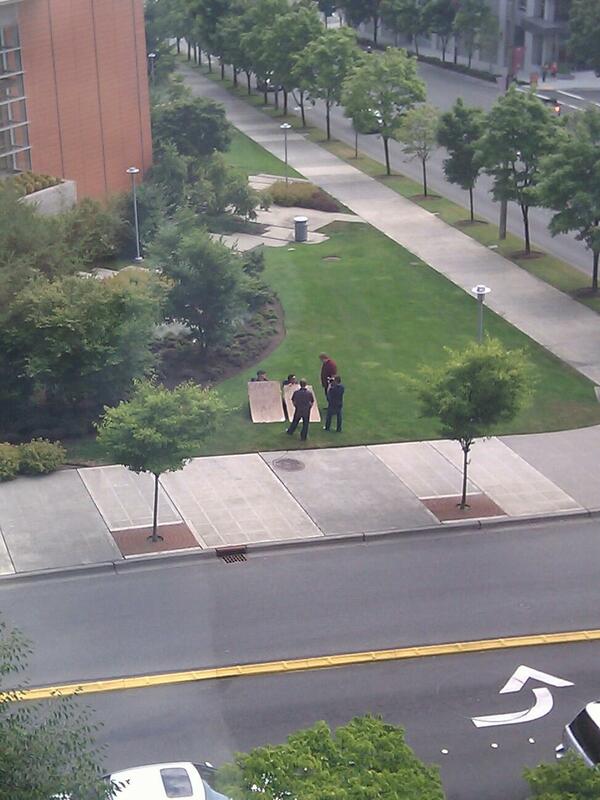 It didn't take long before employees at Valve noticed that these individuals were loitering on the lawn of an adjacent business. Gabe Newell himself took a trip downstairs so that he could personally tell them to move it or he was calling the cops... Oh, sorry, I'm getting my Jack Thompson stories mixed up again! Actually, according to reports, the gentlemen were given a tour of the offices by Erik Johnson and they have been hanging out all day. Gabe also treated them to some lunch a little while earlier. How's that for customer support! We at HalfLife2.net salute thee! Alas, no HL3 info was given. Picket Valve, get free lunch, make Valve look good. Win-win-win situation. I bet they forgot about HL3 by the end of the day. Dammit, I thought about doing when I went to Seattle last year! WIN! Next time there will be ten people or more if fans like that idea. So meet up at Value HQ? They hooked them up to the AI Director. They're just mindless shells now. Good job , lads !! That's how its done!!! "Will stop asking about HL3 for food"
Sorta feels like 2003-2004 again with the fans. Yes! Valve, still so awesome <3. Love the signs too. Ummm, no. Throughout the years, Valve has been very supportive of their community in many different ways. There's a strong reason why Valve has such a loyal and dedicated fan base. Even the guy who stole the source code, after he was busted, explained he didn't do it out of malice, but was a fanatic for Valve and will still continue to buy all their games. They listen to the community and genuinely care about their fans. Gabe is my favourite of all the mens in the world. I remember one of the first Valve fan visits was a guy from this forum, I think his user name was spitcodfry or something? We were all really blown away that he actually got a tour just by calling and asking if he could visit, and how nice it was of Valve to be so welcoming and friendly to their fans. The whole forum went crazy with excitement. Stuff like that, and all the time they took to answer so many of our e-mails are a huge reason I've always remained such a huge fan of theirs after all these years. Haha, yeah! There would be people who would take tours and post any new info on here and it was great. Then some guy posted a pic from a whiteboard and it led to that viral site. Good times. [...] the guy who stole the source code, after he was busted, explained he didn't do it out of malice, but was a fanatic for Valve and will still continue to buy all their games. That's correct, he even wrote that to Gaben and apologized for cracking the HL2 Beta, because he never intented to make it accessible through the internet, it was an accident. Part of this backstory is also that Gaben sent this guy an email because of his fanboyism, allegedly offering him employment at Valve to lure him to the States (that guy was from germany) only to be able to arrest him right away at the airport. And i think he can be happy he didn't face jail time in some U.S. prison but in germany instead, shortly after he got tracked down. You should know better than to troll in the news subforum. The presence of so many mouth-breathing halfwits makes people edgy. Why not just go out there with ****ing bazookas AND the signs?